2nd international conference of the project SACRIMA, The Normativity of Sacred Images in Early Modern Europe, funded by the European Research Council. 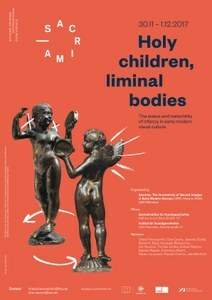 Whether as chubby cherubs, playful toddlers or suffering infants, children have pervaded our visual cultures since antiquity. Instilled with intrinsic emotional connotations and a distinctive aesthetic ambiguity, images of children possess diachronic, transcultural and anthropological relevance. However, Christianity’s attachment to a divine child has catalysed the reception and visual dissemination of images of children in various forms (little angels, Infants Jesus and St John the Baptist, the Holy Innocents, child saints, etc.). While social historians have explored the changes in status and perception of childhood during the early modern period, an extensive exploration of the visual relevance of this theme in sacred imagery has yet has yet to emerge from art historical studies. This workshop explores the visualization and materiality of infancy in early modern sacred art in different medias and from a cross-cultural perspective.